Trying to redesign my server to maximize database performance. I've not used cachecade before and thought I'd give it a whirl in my server to see if it helps database performance. It's hard to get a good read on the H710P cachecade information and most information Dell puts out is pretty high level overview. I've read that cachecade 2.0 is not available on the H710P but the Dell posting talking about this was very old -- is this still true and only cachecade 1.1 is supported as a read-only cache? I had a hard time pinning down up-to-date information on supported SSD drives for use with cachecade. I ended up buying a couple Samsung 850 PRO 128GB drives as I did read a few posts saying these worked well although the information was not directly from Dell. Since this is read-only cachecade I assume these ought to last long enough to make it worth it. Replacing these wouldn't be an issue if they wear. Not sure what kind of life to expect on these but presumably it would be decent enough. SLC would only be a reasonable option if MLC drives fail quickly. The last unknown is how cachecade is applied to virtual devices. Is a cachecaid array global for the entire pool of virtual disks or do you have to associate it with a virtual disk? I specifically want to utilize this for my database server (Sybase ASE 15.7). Right now my Sybase guest is on an 8 disk 15K SAS 300GB RAID10 array. Performance is okay but I'd like to speed it up as the data is critical for accessibility within a reasonable access time. The good news is I have a test server that I get to test all of this on but not being familiar with cachecade and the best way to get performance I thought I'd ask. Currently I have 2 arrays (no cachecade). 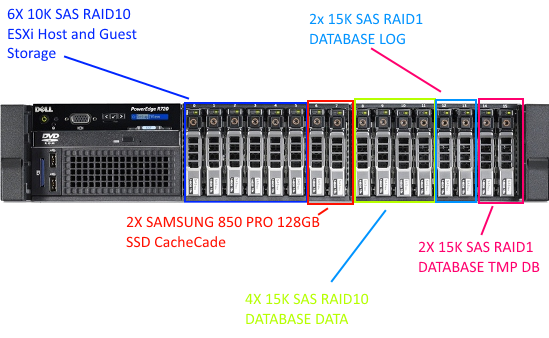 RAID5 DATASTORE1 = 8x 300GB 10K SAS drives in RAID5 for ESXi host and vmware guests. RAID10 DATASTORE2 = 8x 300GB 15K SAS drives in RAID10 for Sybase ASE (RHEL6) guest.